Jesus was born in the town of Bethlehem in Judea. He was born during the time when Herod was king. After Jesus was born, some wise men from the east came to Jerusalem. 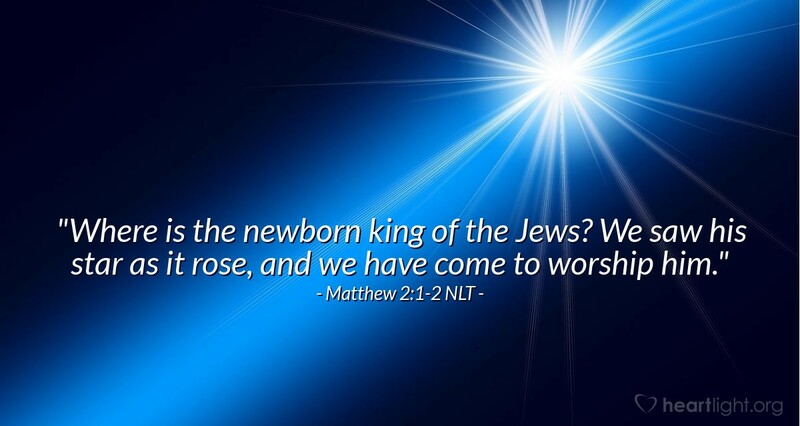 The wise men asked people, "Where is the new baby that is the king of the Jews? We saw the star that shows he was born. We saw the star rise in the sky in the east. We came to worship him." God does the unexpected! There was no way anyone would suspect—much less expect—that Easterners would come to worship a Jewish King, especially a baby one. No normal person would have expected a King to be born in Bethlehem, a little obscure town of insignificance. No faithful Israelite would have ever believed astrologers would be led to the true God through their false, stargazing-worship. (Remember that astrology was steadfastly condemned under Mosaic Law as one of the acts of divination—magically foretelling the future! Deut. 18:9-15) But then, God doesn't have to do things the way normal Israelites, Gentiles, or modern people do them. Aren't we glad God is full of surprises! Aren't we glad he sent Jesus as his greatest Surprise! O Sovereign and Almighty Lord, please forgive me for trying to tame you and make you predictable. You have always been full of surprises. Please "surprise" me in my lifetime by bringing your salvation to every nation, language, tribe, and people in our world. In the name of Jesus I pray. Amen.